Acer has beat Hewlett Packard in India’s PC shipments to become the second biggest vendor behind Dell. Acer holds a market share of 12.1% for the second quarter of 2011. Dell held on to its top position with 16.7% market share. A total of 2.5 million desktop and mobile PC’s were shipped in the second quarter of 2011. Dell, Acer, HP, Lenovo and HCL remained the top 5 brands. 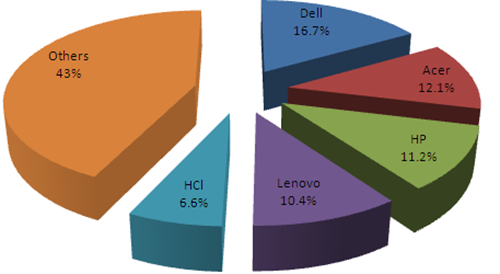 These were the top brands in Q1 2011 too with the sole exception of Acer and HP swapping places. The overall growth is dominated by laptop PC’s which grew at a rate of 17%. Gartner however doesn’t provide the split between laptops and desktops. Indian PC market is largely foreign brand driven. 50.4% of the market is dominated by four foreign PC makers. HCL is the lone Indian brand in the top 5 with 6.6% market share. Though 43% of the PC shipped or close to 1.1 million PC’s shipped are from other brands (probably some local too). Does Gartner track assembled PC’s? It is not clear if Gartner tracks the shipments of assembled PC’s by local vendors. Tracking shipments itself is a difficult process which is error prone. Tracking assembled PC market would be a Herculean task even for Gartner. If assembled PC’s aren’t tracked, then the overall PC market will be much bigger than 2.5 million units. WoW! Coal India beats Reliance to become India’s most Valuable Company by Market Capitalization! New Banking License may now be a Reality! Dell has a very good reputation in the market. People are now mostly buying in the name of Dell. Acer is most popular among students as it offers great services and reliability at a very minimal cost. But I was surprised to know that this list doesn’t include Toshiba. I found Toshiba very good. But may be experts thinks in a different way.